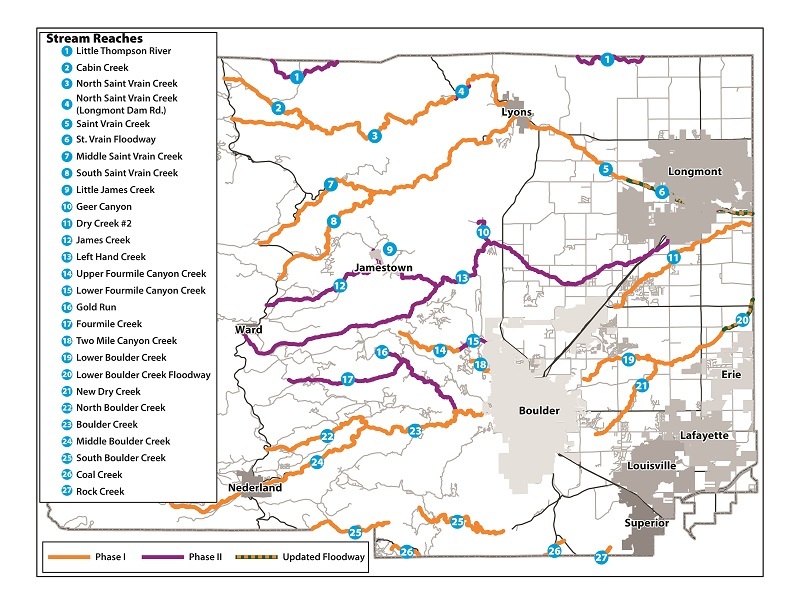 The interactive webmap (use the button above) shows detailed flood risk zones and related FEMA map amendments or revisions that are currently regulated throughout unincorporated Boulder County as Floodplain Overlay Zoning District. This map will update as new FEMA maps become effective throughout Boulder County and as the Boulder County Board of County Commissioners (BOCC) adopts best available information. Map data from Phase I of the CHAMP and related flood studies was adopted by the BOCC through Docket Z-17-0001 and became effective on June 1, 2017. Phase II of CHAMP was adopted by the BOCC through Docket Z-17-0002 and became effective on Aug. 1, 2018 (excluding the lower Boulder Creek floodway from Kenosha Road/115th Street to East County Line Road, which became effective date on Oct. 1. 2018). Map layers in the Phase II were updated as of Aug. 1, 2018 and Oct. 1, 2018, respectively, to reflect these regulatory changes. Please contact the Floodplain Management Team (info below) with questions or to learn more about the floodplain mapping changes.